This date in 1556 saw the Second Battle of Panipat in India … and the consequent beheading of the losing commander. Hem Chandra Vikramaditya was the unfortunate object of this treatment, a remarkable Hindu who was born a commoner and died a king. The early 16th century saw the birth of the Mughal Empire as Turkic Muslim tribes led by the conqueror Babur swept away the Pashtun sultanates in north India. The First Battle of Panipat back in 1526 cinched this conquest. In this unsettled environment, an able man could rise. Few were abler than Hem Chandra, more familiarly known to posterity as Hemu. Born to a family of Hindu priests in a time when Hindu kings had not ruled his homeland for centuries, Hemu first came to prominence as a merchant supplying provisions, and later armaments, for the imperial army. He proved so capable that Islam Shah took him on as an adviser. Now, despite the Mughal conquest, Islam Shah was actually an Pashtun. A weak succession after Babur had thrown the Mughals into retreat, and most of their once and future territory was now under the temporary authority of the Sur Empire. Following Islam Shah’s death in 1554, the political situation for the Sur Empire fell into confusion. A boy-emperor successor was murdered to give way to a drunk, and Hemu emerged as the de facto authority in the chaotic realm … which in practice meant racing around dealing with various military threats. Hemu put down the many internal revolts that flowered after Islam Shah’s death, but his greater problem was the resurgent Mughals. Babur’s heir Humayun had been driven into exile in Persia years ago. Now he returned at the head of an army to retake his patrimony. Even when Humayun himself died in the process (he fell down a flight of stairs*), he bequeathed Hemu a potent foe in the form of his teenage heir Akbar — the sovereign who would eventually be esteemed the Mughals’ greatest emperor. On October 7, 1556, Hemu whipped Akbar at the Battle of Delhi. Entering the ancient capital, Hemu proclaimed himself emperor under the regnal name Raja Vikramaditya. And why not, after all? The kingdom already only maintained itself by Hemu’s own brilliance; he’s reputed to have had an undefeated combat record at this point. But sometimes a single loss is all that’s needed. Hemu was the first Hindu emperor in 350 years, but he only held the position for a month. The new emperor again met Akbar (and Akbar’s regent Bairam Khan) on the fifth of November at Panipat, and this time the Mughals won. Hemu’s valorous exposure to danger proved his undoing when he was struck in the face by an enemy arrow. 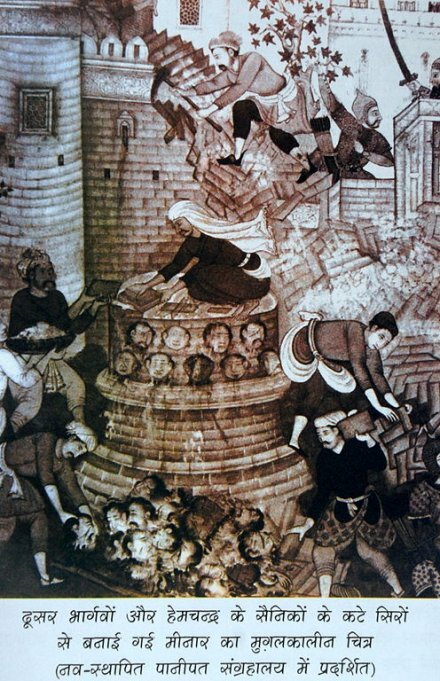 Bairam was desirous that Akbar should give him the first wound, and thus, by inbruing his sword in the blood of so distinguished an infidel, should establish his right to the envied title of ‘Ghazi’ or ‘Champion of the Faith’; but the spirited boy refused to strike a wounded enemy, and Bairam, irritated by his scruples, himself cut off the captive’s head at a blow. However, there are other versions of this story in which the 14-year-old Akbar is not so reticent. Whoever chopped it, the severed head was sent to Kabul to cow Hemu’s Pashtun supporters, while the torso was publicly gibbeted outside Purana Quila. Hemu’s followers were massacred afterwards in numberless quantities sufficient, so it is said, to erect minarets of their skulls. Akbar ruled the Mughal state until his death in 1605. * Humayun’s monumental tomb is a UNESCO World Heritage Site today. 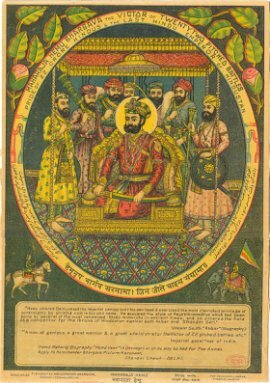 ** See Vincent A. Smith, “The Death of Hemu in 1556, after the Battle of Panipat,” Journal of the Royal Asiatic Society of Great Britain and Ireland (July 1916). Smith’s opinion is that Akbar probably did cut off Hemu’s head personally, but might later have spun the incident in a less distasteful direction. On this date in 1949, Mahatma Gandhi’s assassin was hanged at India’s Ambala Jail, together with one of his co-conspirators. The hatred of a Tory M.P. at the twilight of the empire might be expected, but it was a Hindu nationalist who struck Gandhi down after the partition into a Hindu India and a Muslim Pakistan. Gandhi had vocally opposed partition on the grounds of interreligious tolerance — but he eventually assented to Pakistan’s separation when he became convinced that the alternative was civil war. Distrusted by Hindu partisans for his “appeasement” of minority groups within India, Gandhi survived numerous attempts on his life. But he sealed his fate by fasting to compel Delhi to make its agreed-upon partition payments to Islamabad even in the midst of war. Nathuram Godse, a Hindu nationalist, gunned him down during evening prayers on January 30, 1948. I thought to myself and foresaw I shall be totally ruined, and the only thing I could expect from the people would be nothing but hatred and that I shall have lost all my honour, even more valuable than my life, if I were to kill Gandhiji. But at the same time I felt that the Indian politics in the absence of Gandhiji would surely be proved practical, able to retaliate, and would be powerful with armed forces. No doubt, my own future would be totally ruined, but the nation would be saved from the inroads of Pakistan. People may even call me and dub me as devoid of any sense or foolish, but the nation would be free to follow the course founded on the reason which I consider to be necessary for sound nation-building. I do say that my shots were fired at the person whose policy and action had brought rack and ruin and destruction to millions of Hindus. There was no legal machinery by which such an offender could be brought to book and for this reason I fired those fatal shots. Sixty years later, the subcontinent and the world at large seem more strained than ever by the collision between these men’s visions — the secular and egalitarian as against violent religious animosity. Godse’s old party, the RSS, has become a substantial far-right bloc in the modern political scene. And while the party has always disavowed responsibility for the murder, some still consider Godse a hero. Pakistan, for whose birth Gandhi was slain, totters on the brink of an abyss. Gandhi, meanwhile, is not only the official “father of his country” but has become the very watchword for nonviolence, his tactics and ideas inspiring such luminaries as Nelson Mandela and Martin Luther King, Jr. But his life and legacy remain live topics of research and dispute.